Courtesy of Jana Bernardova, North Channel. Abhejali Bernardová made a successful crossing of the North Channel from Donaghadee in Northern Ireland to Port Patrick in Scotland in 10 hours 23 minutes, the fastest time to date for the 2017 season. Bernardová's sixth career Oceans Seven swim was also the 10th successful solo swim across the North Channel in 2017 governed by the Irish Long Distance Swimming Association. Escorted by pilot Quinton Nelson, she was the first Czech swimmer to complete a crossing of the North Channel. She dedicated her crossing to the 40th anniversary of the Sri Chinmoy Marathon Team and the 30th anniversary of the Sri Chimnoy Oneness-Home Peace Run. She has carried the torch in many countries over the years as a Peace Runner and co-organizer. The night before, there was a 50% chance that she would not go. "Some forecasts were good, some predicted strong winds," wrote Vasanti Niemz. 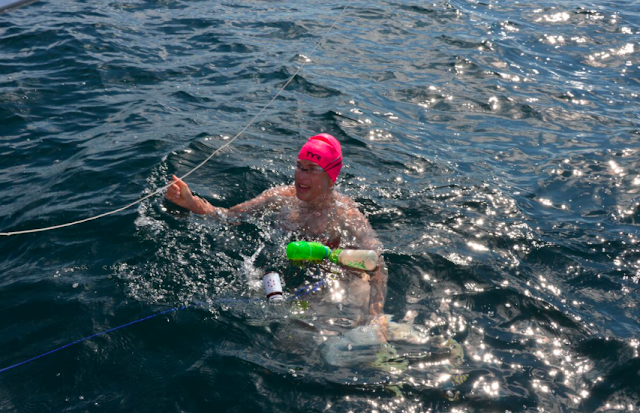 "It was decided to meet at the boat at 5 am the next morning to assess the actual conditions. It was very calm on the Irish side [in the] morning, and so it was a go. The wind only picked up a little to Force 3 or 4 for a few hours later on. The sun came out quite soon. Abhejali was asked to swim hard, keep up the pace, and feed only every hour to avoid wasting time, and even hours from the finish to give it her all." Water temperatures were around 14°C. "But she had trained for it in ice baths at home. Special blessings were a dolphin and a seal near the start and a beautiful rainbow over the landing point. Jellies were present, but the 12 stings on her arms were nothing compared to the painful stings she got in the Molokai Channel." Bernardová said, "I knew it was going to be challenging because of the cold water so I put on 12 pounds of bioprene in preparation. 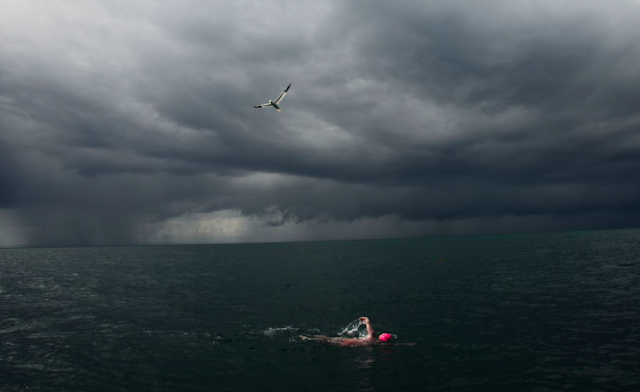 The weather was not perfect, but it was the only slightly possible day in my swim window. 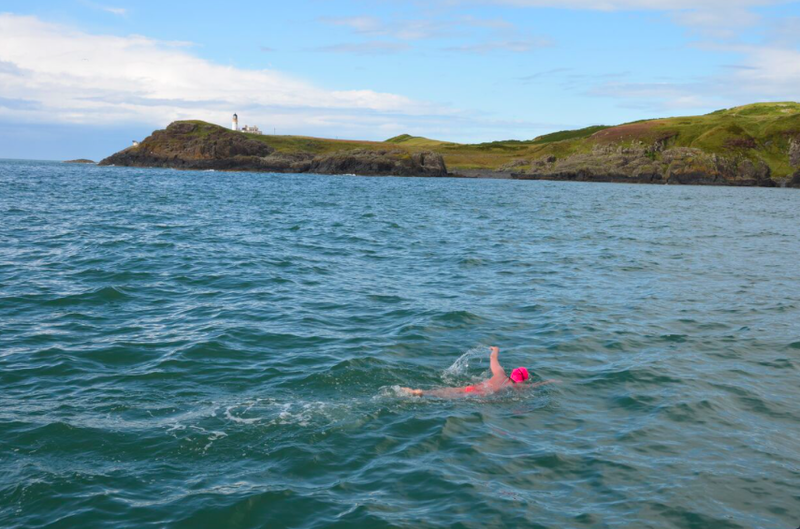 In the end, I was the only swimmer to attempt a North Channel swim today. I encountered a lot of Lion's Mane jellyfish and got stung by about a dozen of them, luckily not in my face. The weather worsened and the water was really cold, so I tried to swim as quickly as possible. Eventually, we were caught up in heavy rain."